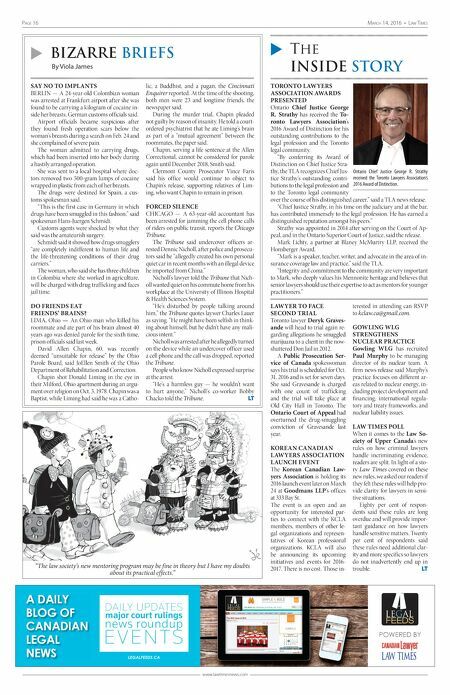 Page 16 March 14, 2016 • Law TiMes www.lawtimesnews.com u Bizarre Briefs By Viola James u The InsIde story A DAILY BLOG OF CANADIAN LEGAL NEWS FEEDS LEGAL POWERED BY LEGALFEEDS.CA LegalFeeds_LT_Mar7_16.indd 1 2016-03-03 10:56 AM SAY NO TO IMPLANTS BERLIN — A 24-year-old Colombian woman was arrested at Frankfurt airport after she was found to be carrying a kilogram of cocaine in- side her breasts, German customs officials said. Airport officials became suspicious after they found fresh operation scars below the woman's breasts during a search on Feb. 24 and she complained of severe pain. The woman admitted to carrying drugs, which had been inserted into her body during a hastily arranged operation. She was sent to a local hospital where doc- tors removed two 500-gram lumps of cocaine wrapped in plastic from each of her breasts. The drugs were destined for Spain, a cus- toms spokesman said. "This is the first case in Germany in which drugs have been smuggled in this fashion," said spokesman Hans-Juergen Schmidt. Customs agents were shocked by what they said was the amateurish surgery. Schmidt said it showed how drugs smugglers "are completely indifferent to human life and the life-threatening conditions of their drug carriers." The woman, who said she has three children in Colombia where she worked in agriculture, will be charged with drug trafficking and faces jail time. DO FRIENDS EAT FRIENDS' BRAINS? LIMA, Ohio — An Ohio man who killed his roommate and ate part of his brain almost 40 years ago was denied parole for the sixth time, prison officials said last week. David Allen Chapin, 60, was recently deemed "unsuitable for release" by the Ohio Parole Board, said JoEllen Smith of the Ohio Department of Rehabilitation and Correction. Chapin shot Donald Liming in the eye in their Milford, Ohio apartment during an argu- ment over religion on Oct. 3, 1978. Chapin was a Baptist, while Liming had said he was a Catho- lic, a Buddhist, and a pagan, the Cincinnati Enquirer reported. At the time of the shooting, both men were 23 and longtime friends, the newspaper said. During the murder trial, Chapin pleaded not guilty by reason of insanity. He told a court- ordered psychiatrist that he ate Liming's brain as part of a "mutual agreement" between the roommates, the paper said. Chapin, serving a life sentence at the Allen Correctional, cannot be considered for parole again until December 2018, Smith said. Clermont County Prosecutor Vince Faris said his office would continue to object to Chapin's release, supporting relatives of Lim- ing, who want Chapin to remain in prison. FORCED SILENCE CHICAGO — A 63-year-old accountant has been arrested for jamming the cell phone calls of riders on public transit, reports the Chicago Tribune. The Tribune said undercover officers ar- rested Dennic Nicholl, after police and prosecu- tors said he "allegedly created his own personal quiet car in recent months with an illegal device he imported from China." Nicholl's lawyer told the Tribune that Nich- oll wanted quiet on his commute home from his workplace at the University of Illinois Hospital & Health Sciences System. "He's disturbed by people talking around him," the Tribune quotes laywer Charles Lauer as saying. "He might have been selfish in think- ing about himself, but he didn't have any mali- cious intent." Nicholl was arrested after he allegedly turned on the device while an undercover officer used a cell phone and the call was dropped, reported the Tribune. People who know Nicholl expressed surprise at the arrest. "He's a harmless guy — he wouldn't want to hurt anyone," Nicholl's co-worker Bobby Chacko told the Tribune. LT TORONTO LAWYERS ASSOCIATION AWARDS PRESENTED Ontario Chief Justice George R. Strathy has received the To- ronto Lawyers Association's 2016 Award of Distinction for his outstanding contributions to the legal profession and the Toronto legal community. "By conferring its Award of Distinction on Chief Justice Stra- thy, the TLA recognizes Chief Jus- tice Strathy's outstanding contri- butions to the legal profession and to the Toronto legal community over the course of his distinguished career," said a TLA news release. "Chief Justice Strathy, in his time on the judiciary and at the bar, has contributed immensely to the legal profession. He has earned a distinguished reputation amongst his peers." Strathy was appointed in 2014 after serving on the Court of Ap- peal, and in the Ontario Superior Court of Justice, said the release. Mark Lichty, a partner at Blaney McMurtry LLP, received the Honsberger Award. "Mark is a speaker, teacher, writer, and advocate in the area of in- surance coverage law and practice," said the TLA. "Integrity and commitment to the community are very important to Mark, who deeply values his Mennonite heritage and believes that senior lawyers should use their expertise to act as mentors for younger practitioners." LAWYER TO FACE SECOND TRIAL Toronto lawyer Deryk Graves- ande will head to trial again re- garding allegations he smuggled marijuana to a client in the now- shuttered Don Jail in 2012. A Public Prosecution Ser- vice of Canada spokeswoman says his trial is scheduled for Oct. 31, 2016 and is set for seven days. She said Gravesande is charged with one count of trafficking and the trial will take place at Old City Hall in Toronto. The Ontario Court of Appeal had overturned the drug-smuggling conviction of Gravesande last year. KOREAN CANADIAN LAWYERS ASSOCIATION LAUNCH EVENT The Korean Canadian Law- yers Association is holding its 2016 launch event later on March 24 at Goodmans LLP's offices at 333 Bay St. The event is an open and an opportunity for interested par- ties to connect with the KCLA members, members of other le- gal organizations and represen- tatives of Korean professional organizations. KCLA will also be announcing its upcoming initiatives and events for 2016- 2017. There is no cost. Those in- terested in attending can RSVP to kclaw.ca@gmail.com. GOWLING WLG STRENGTHENS NUCLEAR PRACTICE Gowling WLG has recruited Paul Murphy to be managing director of its nuclear team. A firm news release said Murphy's practice focuses on different ar- eas related to nuclear energy, in- cluding project development and financing, international regula- tory and treaty frameworks, and nuclear liability issues. LAW TIMES POLL When it comes to the Law So- ciety of Upper Canada's new rules on how criminal lawyers handle incriminating evidence, readers are split. In light of a sto- ry Law Times covered on these new rules, we asked our readers if they felt these rules will help pro- vide clarity for lawyers in sensi- tive situations. Eighty per cent of respon- dents said these rules are long overdue and will provide impor- tant guidance on how lawyers handle sensitive matters. Twenty per cent of respondents said these rules need additional clar- ity and more specifics so lawyers do not inadvertently end up in trouble. LT Ontario Chief Justice George R. Strathy received the Toronto Lawyers Association's 2016 Award of Distinction. "The law society's new mentoring program may be fine in theory but I have my doubts about its practical effects."